Well it is Friday and I have not written a blog post since Sunday. I won't lie, I did not even try to write one - I have lost my blogging mojo (I am not sure how much mojo I actually had to begin with : ) ). So in an attempt to get back in the groove of posting and reading and commenting I am posting some pictures from our week. I included links to all the lovely ladies who shared their ideas through their blogs (cause they obviously have their mojo still) and that I gladly borrowed! Attacks of the heart. 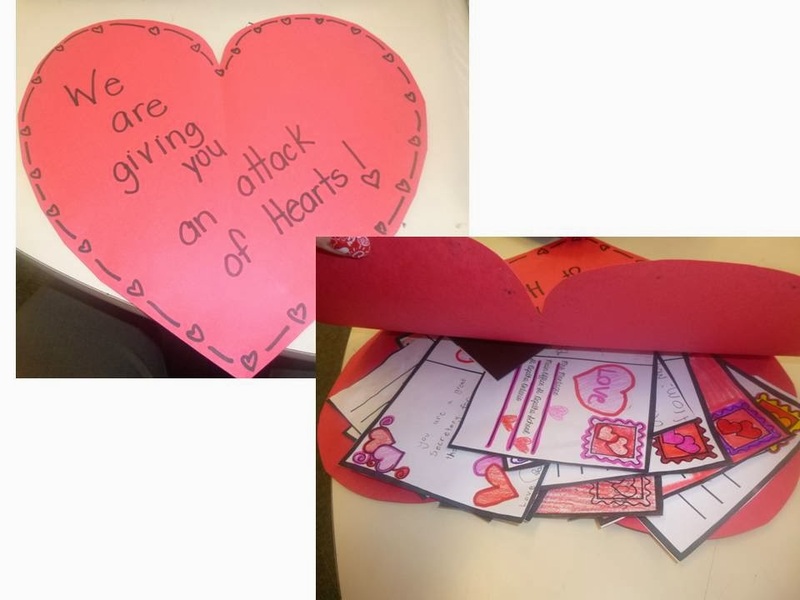 I got this idea from Chalk One up for the Teacher (awesome post on Kindness activities) during the fabulous Bright Ideas Blog Hop (kudos to who ever organized that - loads of great ideas!!) 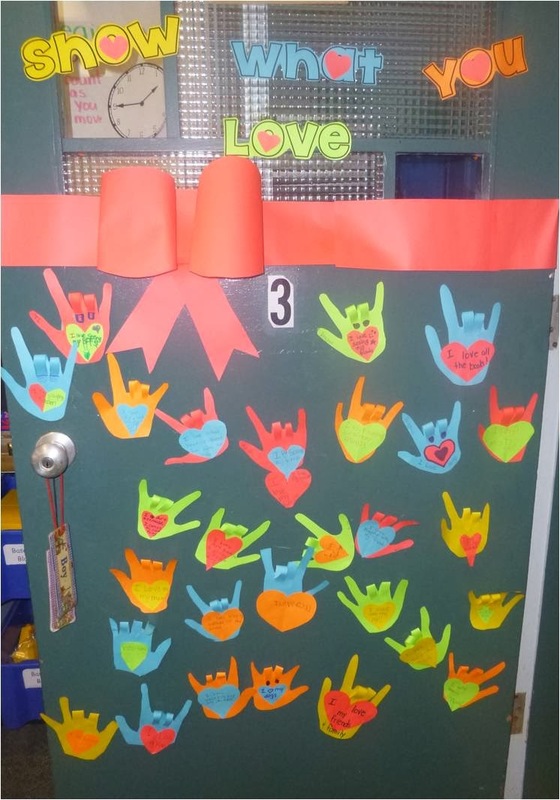 We have been writing notes and giving little gifts to people around our school. This month our focus value is kindness so we are trying to focus on actually doing something that is kind. So far we have attacked our secretary (as shown in the pictures below), the Grade 7/8's that organized our Winter Olympic Fun day and our Kindergarten buddies. Show What You Love door. I got this idea from Blair at One Lesson at a Time (also from the Bright Idea blog hop). She includes great directions if you want to make a love door too. 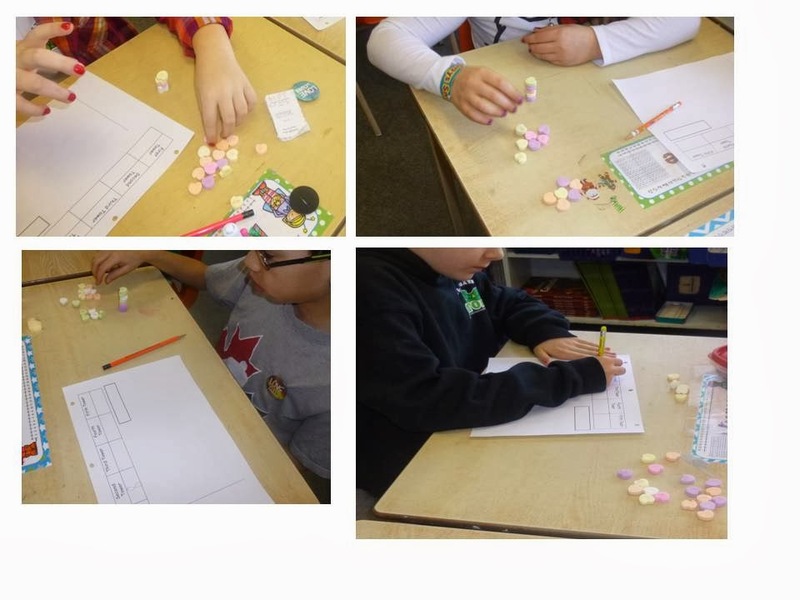 We started our data management unit and we stacked our conversation hearts to collect some fun data. We turned our data into a pictograph - stress free and engaging start to our unit for sure! We made our Valentine holders. 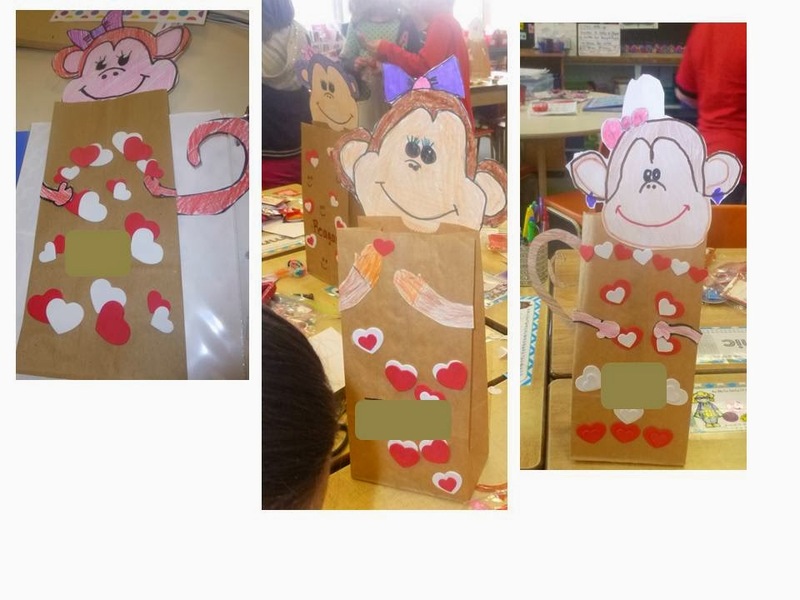 I took the monkey drawing idea from a Rockin and Lovin Learnin teacher I know, Alison and turned them into bags to hold our treats. Check out her awesome blog post for links to the instructions on how to draw a monkey face. 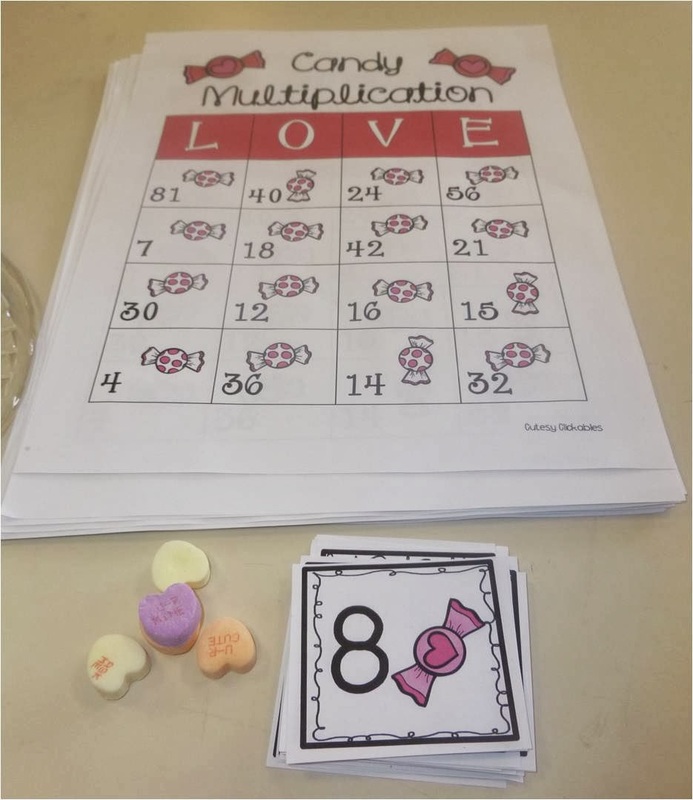 We played Valentine Multiplication bingo thanks to the awesome freebie from Amanda and Stacia at Collaboration Cuties! My kids loved it and were sad when the recess bell rang!! We used conversation hearts as our markers and if they won they got to eat a candy! Hope to see you again tomorrow!! Oh my goodness! Your Valentine folders are adorable! Enjoy your long weekend! Such cute activities! I can't believe not blogging from Sunday to Friday is losing your Mojo! I have completely killed my mojo many times then! Don't worry about the frequency of your posts...I am always so happy when one pops up in my reader since I always enjoy what you have to share. Today included! You have a lot of great Valentine's activities here! Thank you for sharing them. I love the kindness activities. I need to have my students do more things like that. I know they would enjoy it. It's so easy to get behind on the blogging when you're doing so many wonderful things in your classroom!! :) Head up, you've got great things to share! I love the kindness activity!! No matter how often or seldom you post, I'll be reading! !